How Much Will It Cost Patriots Fans to Get to the Super Bowl? 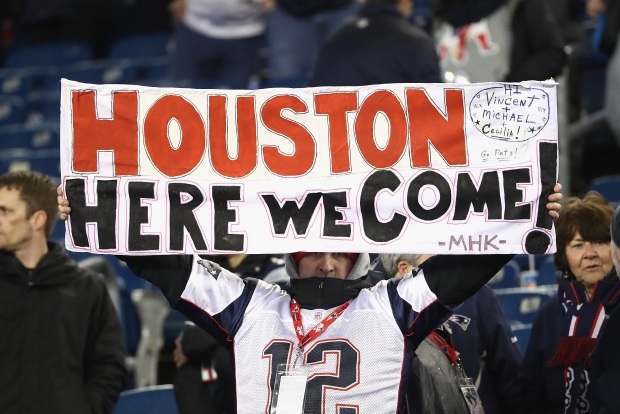 Several airlines, including JetBlue and Southwest Airlines, have added flights to Houston to handle the demand from many New England Patriots fans heading to the Super Bowl, but that's if the cost of the trip is manageable. By our calculations, even if a fan bought the cheapest airfare, Super Bowl ticket and stayed at a cheap hotel, it would still cost you about $5,000 to get to the big game. "If you want to go to the Patriots game and be there for the Super Bowl, you're looking at packages running over $7,000 per person without air," travel advisor Rick Carlson said. That package includes just one game ticket, which according to StubHub, is averaging about $5,200 - more than double what it cost four years ago. Getting to the game is just as expensive. While some Patriots fans we asked said they would be willing to pay between $500 to $1,000 for round-trip airfare, the actual rates are much different. JetBlue's round-trip direct flights to Houston from Boston will cost a Patriots fan about $1,800. If the fan decided to fly out of Providence, it would cost them $1,600. The cheapest ticket was on American Airlines for about $600. As for lodging, the most expensive accommodations we found was for $1,500 a night, while the cheapest one near NRG Stadium was $385 a night. What Would Brady Tell Goodell After Super Bowl? "It gets more expensive every time the Patriots get in," to the Super Bowl, Carlson said. For some fans, the skyrocketing prices are just too much. "It's way too expensive. The price of everything has gotten out of control," fan Lauren Leary said. "Even the cost of a beer, $12 or $13."